What can you do? You have to take a picture when you see this as the banner headline outside a newsagent in St Andrews. And can you blame them? I mean, the Courier only really covers North Fife, and it's a daily. They have to get a major news story every day to put on their posters. p.s. By amazing synchronicity, the same day I snapped this, the BBC asked for newspaper billboard photos. This photo is now part of their Flickr pool. 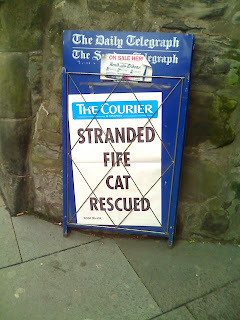 Labels: "stranded fife cat rescued" "courier" "dundee" "st andrews"